Recollections of conversations with Mrs Garrett lead me to believe that she was trained as a teacher at Goldsmith's College, London. After spending a year at a Finishing School in France she became a Vicar's wife. The Rev and Mrs Garrett spent some of their married life abroad (in Madeira ?) where she ran a private school for English speaking children. By 1944 Mrs Garrett was a widow; she had one son and two daughters, Elizabeth who was at Oxford University and Margaret who wanted to train as a teacher. At first Mrs Garrett was assisted in school by Mrs Chandler, then by a succession of infant teachers, permanent and temporary, including Mrs Clark, Miss Harris and Mrs Smith. I joined the staff in April 1949. I enjoyed working with Mrs Garrett, as indeed I did with the three headteachers who followed her, during the thirty happy years I spent at Frieth School. I remember Mrs Garrett as a ladylike person who always dressed immaculately, she was well spoken and well educated; she could command respect and had no discipline problems. Whilst a regular worshipper at Frieth Church she did not take part in organising Village activities out of school hours; there was no real need as this area was covered by the Priest-in-charge and his family. She chose her friends from the small intellectual section of the population that had moved into the village more recently. Mrs Garret's method of education differed from that favoured by previous heads; it was a method rather too modern for the village at that time. She believed in setting work for her pupils to do and encouraging them to find the answer for themselves. The more scholastic pupils benefitted from this approach, but the rest would rather have been entertained by the class lessons, which in those days were termed teaching. To the best of her ability, Mrs Garrett made her pupils polite and well mannered both to one another and to adults; oddly enough her efforts in this direction were not wholly appreciated by some parents. To me the school appeared a very happy little family and I'm sure the children were happy too. 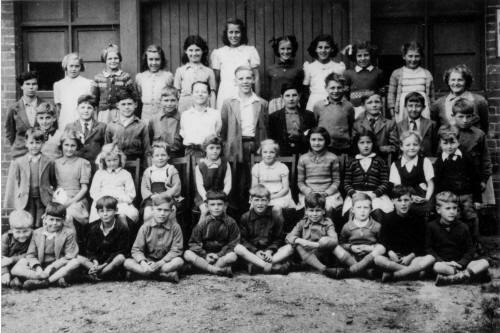 Between 1944 and 1947 the School Roll declined as evacuees returned home. The school was further depleted when transport to the Marlow C of E Schools was provided by the Education Authority. This was to give the opportunity of attending a Senior school to all pupils over 11 years of age (Note 46). 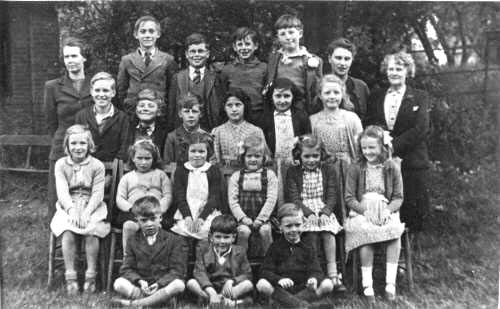 In September 1949 Frieth School was officially decapitated and became a Primary C of E School for children aged 5-11 years. In April 1949 there were 21 children on roll, 11 Infants and Transition and 10 Juniors. July 1946 : The water closet system has now been completed and also the canteen building. As mains water had to be installed for the canteen the old building which housed the "offices" had water closets fitted. and basins were plumbed in the front and rear cloakrooms. A cesspool, constructed in the Village Green, took the effluent. In 1950 the interior of the building was partially redecorated and new drainage pipes put in to take the rainwater from the roof. Neither were the new innovations of water closets and canteen without problems. 1947 and 1948 were severe winters, the water pipes were frozen and the lavatories unusable (Note 48) The cook managed with the use of the kitchen next door to the school. Unlike her predecessors, Mrs Garrett never closed the school. Regular visitors called as before and added to their number were the Canteen Organiser, the Youth Organiser to talk to the school leavers about employment and the School Librarian. In 1949, instead of receiving boxes of books from the Central Library, a library van called and teachers were able to choose the books most suited to their children. May 1947 : This School is one that I hope will be able to continue as an Aided School under the 1944 Act, as it makes a valuable contribution to the life of the place. Apart from the usual coughs and colds there is very little reference to illness in Mrs Garrett's records. Immunisation had eliminated diphtheria and the improved water supply and sanitation had almost overcome scarlet fever. School milk and meals ensures that every child was fed. As previously stated, most of the academic most of the academic subjects were treated individually. Mrs Garrett excelled in needlecraft, especially embroidery and knitting. Music was taken by the assistant teacher and most of the PE and games. PE lessons were enlivened by the use of small apparatus, soft balls, hoops and ropes. Both boys and girls joined in playing rounders in the summer and netball in the winter. The boys were allowed to play cricket on the Village Green during the lunch break. National events were recorded in the Log Book and those to do with the Royal Family marked by special prayers or hymns. V.E. day was celebrated by a short ceremony in school followed by the BBC broadcast. Mrs Garrett was one of the first people in the village who was able to have a television set (Note 50). She took older pupils up to her house to see the wedding of Princess Elizabeth [ 20th November 1947 http://www.bbc.co.uk/archive/princesselizabeth/6606.shtml ] and other events of importance or national interest. Various plays and musical items were performed by the children but the production of these was more the province of the assistant teacher. Unfortunately in 1951/52 when Mrs Garrett was over sixty her daughter Elizabeth, who had suffered from nervous trouble, became ill again and naturally her mother was very worried. Also there was a burglary at the School House which made Mrs Garrett very nervous about sleeping in the house alone. I had to go into hospital for an operation in June 1952 and my absence increased the workload of the headmistress. Added to this a section of the parents seemed to have become dissatisfied with the teaching their older children were receiving. This combination of events caused Mrs Garrett to resign in July 1952. Click to go on to the next chapter "September 1952 - April 1953"
(45) Mrs Garrett was a cat lover and had two magnificent grey tabbies which came to school with her, one slept in the top drawer in the desk and the other curled up in the waste paper basket! (46) 1930 "A conference of Managers and teachers was held at Lane End. It was decided that a Senior Central School should be erected at Lane End to accommodate, amongst others, the 11+ children from Frieth School" This decision was never implemented. (47) In between cleaners the staff lit the fires rather than endure the cold. (48) . . . and every severe spell in winters thereafter. 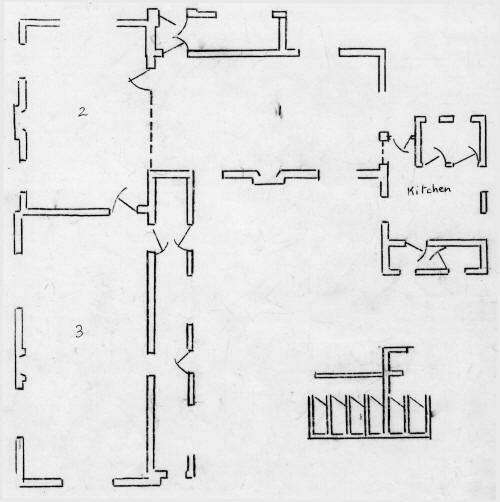 For example even in 1984/85 : Cisterns frozen solid for two periods, the last for a fortnight, during which the toilets were handflushed by the staff (head teachers and ancillary) using buckets of water. (49) When solely a Church of England school the Church was responsible for all upkeep. When Aided the Church was responsible for the outside fabric, the Education Authority being responsible for internal upkeep.